Memories from the last Clasico would still be fresh. Especially in El Pistolero's mind. Whoa, whoa, whoa. What just happened? The world is not stable right now. There are football fans jumping up and down all over the world. Why? It is the El Clasico, ladies, and gentlemen. It is not just an El Clasico, it is a Clasico in the semi-finals of the domestic cup competition in Spain, the Copa Del Rey. As a cherry on top of the cake, we will have, not one, not two, but three El Clasicos in a span of just under a month. Three El Clasicos. Football, bloody hell. This is fun, this is a roller coaster ride, this is it. So let us revisit what transpired the last time both teams were on the same pitch. One. Two. Three. Four. Five. 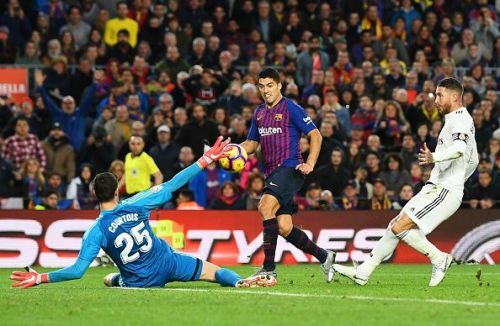 As simple as that, Barcelona tucked five goals past Thibaut Courtois. The silver lining, without Lionel Messi on the pitch. But now, exactly how different are things? Let us inspect. Real Madrid has recovered from a very rough patch that they were having back then. They have a coach who has provided some stability to the team. The youngsters are being given opportunities and they are making every use of it. Marcos Llorente, Federico Valverde, Sergio Reguilon, all have shown the quality to start for the team. With the exception of one player, all the others seem content. Isco Alarcon. Poor lad hasn't even got 90 full minutes in Copa Del Rey and is fighting with Fede Valverde for a starting spot in the league. The only decision that doesn't make sense from Solari. What about Barcelona? They are good and they are better. They are breathing easily at the top of the table with Atletico five points behind them. They are ready to face Lyon in the Champions League. They have all their players in a rich vein of form. Even Coutinho. Dembele is injured but he will be back before the first leg. There are a lot of players who are riding high on the form. Lionel Messi, Luis Suarez, Gerard Pique, Karim Benzema, Dani Ceballos, all are in red hot form. The form of the team doesn't even matter when coming into the Clasico. Well, dates are set and thus the teams can have a look at the calendar. Let us look at fixtures preceding the first leg. Madrid faces Alaves and Barcelona faces Valencia. Tougher fixture here is for Barcelona. But after the fixture, Real Madrid has to face Atletico Madrid and then Ajax just one week. But leading up to the second fixture, Madrid has to face Girona and then Levante. That is point blank easier than face Lyon away in the Champions League and then face Sevilla away from home. Benzema has been on red-hot form recently and is the key man for Madrid in the Clasico. It is not a necessity that whatever we speculate will happen. But nevertheless, let us look at it. By no means will both the teams go for a lineup that is entirely different from the one that plays in the league matches. The lineup would have depended on the priority that the teams give to the cup but for the Clasico. There is no bigger priority than the El Clasico. Barcelona just has too good of a bench strength as compared to Real Madrid. They have Lenglet, Pique, Todibo, Murillo and maybe even Umtiti. They can afford to start Lenglet and Pique in the Clasico and then rest one of them in the following league game. Madrid doesn't have that much luxury. Let us say they start Ramos and Varane in the central defence, not taking chances in a Clasico with Javi Sanchez. Ramos and Nacho are both one yellow card away from missing the Madrid Derby. Varane will miss the Alaves game, so chances are high that Madrid might lose one or maybe both of their central defenders for the Madrid Derby. Madrid's problem arises after the game in the league. This is where bench strength comes in handy for Barcelona. 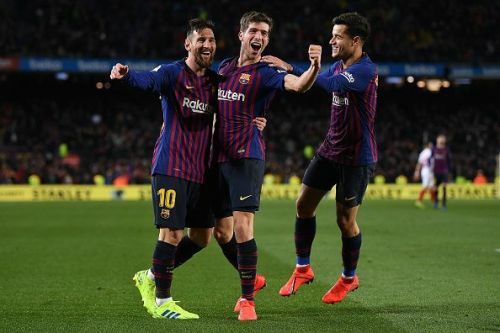 FC Barcelona would need all three of them to perform in the best possible way. Sergi Roberto is a clutch player in El Clasicos, Coutinho has to continue on his momentum, Messi is well..., he is Messi. Moving on to midfield. We can expect to see Modric, Casemiro, and Kroos in the midfield for the Clasico. They can easily start Marcos Llorente with Modric and Ceballos for the Atletico game and bring their main men back for the important Ajax game. Barcelona is not bad when it comes to midfield as well. We can see Arthur, Rakitic/Vidal, and Busquets for the extremely important Clasico. The next game is against Athletic Bilbao. Last time, Barcelona was bullied by Athletic Club and held to a draw. To not be bullied, there is a simple trick. Put Arturo Vidal in there with any of Alena, Arthur or even Coutinho in the midfield. For the forward line, this is a no-brainer for Real Madrid. 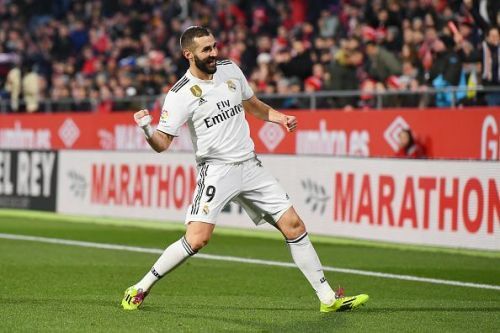 Benzema and Vazquez will probably start in the Clasico unless Solari lets go of his ego and starts Isco. One of Bale and Vinicius, probably Bale will start the Clasico due to prior experience and also because the Madrid Derby is also coming up. Coming to Barcelona, they won't be resting Messi for this one, hell no. Coutinho might get the nod ahead of Dembele who would be needed in following games. A Clasico without Suarez is unimaginable, especially when Kevin Prince Boateng has not got enough match practice. These are the predicted lineups. We cannot see both teams take any chances with B-Team players like Chumi, Miranda, Javi Sanchez or Reguilon. For an El Clasico, Sergi Roberto and Rakitic are a must. They perform better than anyone in the Clasico. The places where changes can occur here are as follows. Dembele might take up Coutinho's place. It's possible. Vidal or Alena can start if Valverde puts Rakitic as a pivot and rests Busquets. Unlikely though. Real Madrid has to be going with their best centre-back pair along with Marcelo. Odriozola and Carvajal are both eligible to play right-back but it seems Carvajal will start here while Odriozola prepares for the Madrid Derby. The most probable midfield trio is chosen here. Ceballos can also start in place of Kroos. Bale is likely to be starting the Clasico while Vinicius takes care of Atletico, the reverse is also possible. If Solari is not adamant, then Isco can replace Vazquez at right-wing.